What a difference! 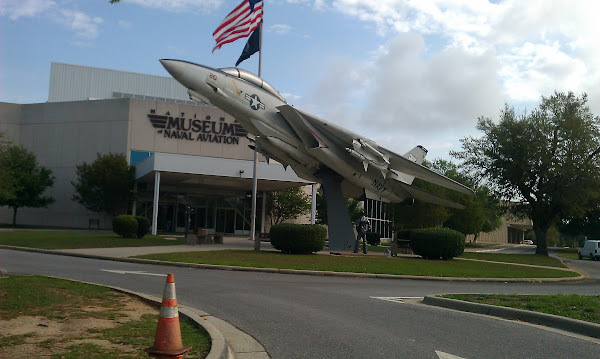 On our first visit to the Naval Air Museum with Jim and Joan, it was totally mobbed. Because it was so crowded and we arrived later in the day, we didn’t get a chance to see everything so on Friday we headed back to Pensacola. We arrived there around 9:15 a.m. and hardly anyone else was there. 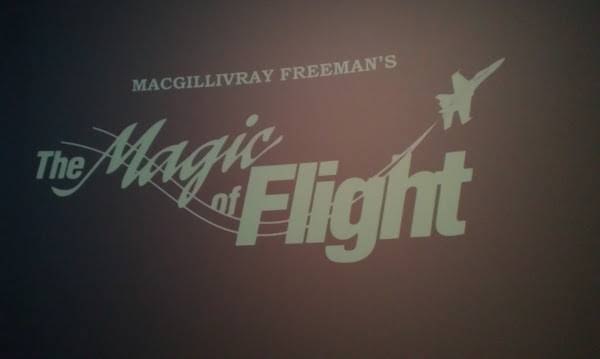 After stopping at the Information Desk to obtain a map, we also obtained passes to go on the free Flight Line tour at 10:00 a.m. From there we went over to the IMAX ticket desk and purchased tickets ($8.50) to the Magic of Flight movie. Since we had a little time to kill, we headed over to Hangar One which is the newest expansion at the museum. In this hangar, there are displays of aircraft and exhibits of post-World War II era including Marine One presidential helicopter, a Prisoner of War exhibit, Coast Guard aircraft and more. When we entered, a volunteer at the desk stopped us to give us a brief introduction to what we were about to see. This gentleman was a retired pilot, who said he had flown practically all of the aircraft on display in that hangar. Whew, that’s a lot of planes! After taking a few quick photos, we had to leave to catch the Flight Line tour. The Flight Line trolley tour is a 45 minute tour of the aircraft displayed outside on the Museum’s “Flight Line” just off the runway awaiting restoration. The trolley driver was a volunteer, also a pilot in both the Korean and Vietnam Wars. As he drove by each plane, he not only gave a brief description of the plane but would also tell some interesting story about it. Among some of the planes that he talked about was a plane used in the Berlin Airlift, Fat Albert, the plane that was used in support of the Blue Angels, a plane similar to the one Tom Cruise flew in Top Gun and lots more. Too many to remember them all. Quite fascinating! There are a number of photos in the Picasa photo album below – realize that we were both taking pictures so there could be duplicates and that they were difficult to take through the front window of the trolley. After the tour, it was time for the IMAX movie. This particular movie was about the history of flight and how the Blue Angels trained. It was very good! 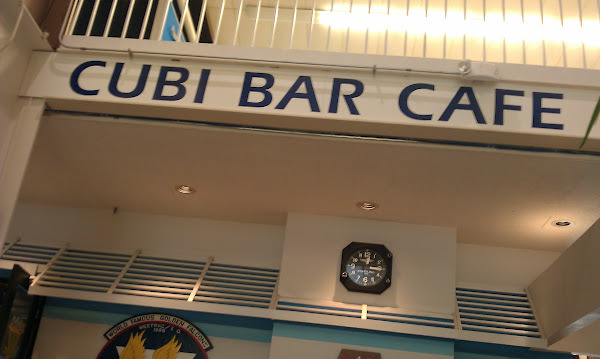 By now we were hungry so we stopped at the Cubi Cafe where we both had steak paninis which were quite good. As we exited the theater I asked Rob if he was going to go on the flight simulator which was directly across from the theater. Before he had a chance to answer, the gentleman at the desk yelled over that because we had attended the movie, tickets were only $3.50 instead of $5.00. Well, Rob just couldn’t pass up that deal so he convinced me that I should go on it with him. I was told that it didn’t go upside down and wasn’t that bad so with a little trepidation into the simulator capsule we went. It is described in the brochure as “a five-minute, multi-sensory experience that combines a movie-like audiovisual presentation using a high-definition projection screen and surround-sound, with the motion of the ride compartment.” It wasn’t bad at all! After that we returned back to Hangar One to see the rest of the displays. Because we had so many pictures, we thought it best just to provide the link to the Picasa web album. Some of these pictures are the same as ones we took on our first visit but we took more since it was not so crowded. To view the album, click here.